CINCINNATI – Despite years of research, the verdict is still out as to whether cell phone radiation causes cancer. The science is still evolving, and researchers have not reached a consensus about whether prolonged cell phone risk increases the risk of developing a brain tumor. Although there is no strong evidence that radiofrequency waves from cell phones is harmful, specialists at Mayfield Brain & Spine advise cell phone users to take reasonable precautions to reduce their exposure. "We have always said that cell phone users should avoid placing the phone to their ear," says Norberto Andaluz, MD, a Mayfield neurosurgeon and brain tumor specialist. "A wireless or remote receiver or a speaker setting should be used for frequent or extended conversations." Christopher McPherson, MD, another Mayfield neurosurgeon and brain tumor specialist, agrees. "Although we cannot say with certainty that cell phones cause cancer, it is wise to take precautions when you don't know whether something is safe or unsafe. That means keeping the phone away from your head." Cell phones are used by 4.7 billion people around the world. Concern over possible risks from low-level radiation emitted by cell phones has persisted with the publication of numerous studies. Some studies pointed to an elevated risk of brain tumors, while others did not. In 2011 the International Agency for Research on Cancer (IARC), an arm of the World Health Organization, described cell phone use as a possible carcinogen. The IARC placed the use of cell phones in the same category for cancer risk as 266 other environmental agents, including coffee, Styrofoam, lead, engine exhaust and chloroform. A team of 31 scientists from 14 countries, including the United States, evaluated exposure data, studies of cancer in humans, studies of cancer in experimental animals, and other relevant data to reach their conclusion. More recently, HealthDay reported that partial study results released by the U.S. National Toxicology Program "showed that radiofrequency radiation was associated with a higher risk of two cancers in male rats." The American Cancer Society noted that the study found "a dose/response effect: the higher the dose, the larger the effect, a key sign that this association may be real." "Your cumulative exposure to radiofrequency energy is a function of the number of calls you make, how long each call is, how far you are from the nearest base tower, the local cell phone traffic, the signal strength, and whether you are using a hands-free unit or not," Dr. McPherson says. "Cell phones need to be used sparingly by adults, and their use by children and teens, who have growing brains, should be restricted." Avoid use of cell phones while driving and cycling, because the risk is comparable to the risk of driving under the influence of alcohol. Keep cell phones away from your head; a safe distance is at least 5 inches away from the skull. Keep cellphones away from your body and your bed at night. Use an air-tube headset, a remote receiver, or the phone's speaker setting. Take off headsets when not on a call. Limit the use of cell phone in children to reduce exposure to the developing brain. Alternate sides and limit the duration of your calls. Text more, listen more, and talk less. Cell phones emit radiation when you talk or text, but not when you are receiving signals or messages. Do not try to communicate when the signal is poor (e.g., in an elevator, building or rural area). Poor signals mean your cell phone needs to send stronger signals to the tower, which results in a higher level of radiation. Do not use the "radiation shield." Radiation shields such as antenna caps or keypad covers reduce the connection quality and force the machine to emit higher radiation to deliver a stronger signal. The Mayfield Clinic is recognized as one of the nation's largest and most advanced physician organizations for clinical care, education, and research of the spine and brain. Supported by a multidisciplinary team of specialists in neurosurgery, interventional radiology, neurocritical care, and physical medicine & rehabilitation, the Clinic treats 25,000 patients from 35 states and 13 countries in a typical year. 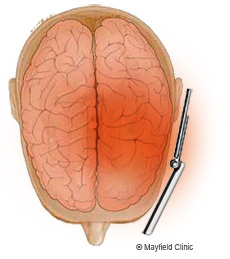 Mayfield's physicians have pioneered minimally invasive surgical procedures and instrumentation that have revolutionized the medical art of neurosurgery for brain tumors and neurovascular diseases and disorders.